I’m sorry I haven’t posted in a while. You see, I’ve been a little bit busy. In the course of the past couple of weeks we have welcomed a new addition to our little family, become total enraptured with him, and have managed to spend all our waking hours feeding, literally, his burgeoning appetite. And speaking of waking hours, those are now pretty much most of my hours, while my sleeping hours have dwindled to a small fraction of what they used to be. All worth it to have little H in our home. He fills our hearts and our arms — again quite literally, as he was born much bigger than his big sister. I love nothing better these days than squeezing all four of us into our bed for books, snuggles, and general feelings of contentment. And I realize (once again) that the best things in life do not come with a high price tag or in fancy trappings. And so, posting will most likely be sporadic, as we are all adjusting to the new schedules…or lack of thereof. But, we do need to eat so please check back – perhaps something quick and easy that we can whip up in the time it takes for a very hungry baby to nap, or maybe a one-pot meal that we can leave to cook long and slow without much attention. I’m raring to get back in the kitchen. ** This short ribs adobo from The Adobo Road Cookbook was awesome! I highly recommend it, and the book. Marvin does all Filipinos proud! ** Simply put, one of the best chocolate chip cookies I have ever tried. ** And if your going to make the best cookies…you might as well make the best brownies too. ** What’s not to love about an oozy grilled cheese sandwich, especially if it’s dotted with pickled jalapeños and cooked a la French toast. ** Jamie Oliver’s way of cooking lamb shanks in foil parcels have produced some of the most tender and delicious shanks ever to come out of my oven. As for food, I have an Asian inspired braised chicken dish that I made before giving birth that I hope to have up here soon…so stay tuned! Until then, have a grand weekend full of magical moments! Congratulations, Joey! 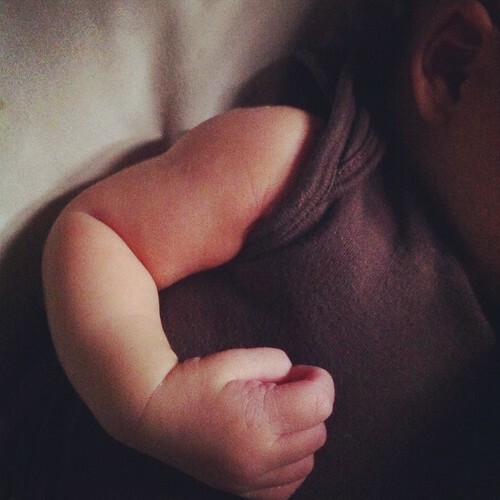 Judging from the arm, I'm thinking baby H is a lovable wee pudgekin – and such an appetite! Owwww happy news. Congratulations Joey!!! JOEY. YOU DID IT AGAIN!! Congrats to you and the family!! 😀 Welcome, Little H! Congratulations! Enjoy every moment with your precious little ones! oh wow! Lots of congratulations!! !I'm very happy for you. To become mom for the second time is wonderful!! !When you'll have little time to spend, if you want, come to my blog, there's a surprise for you!!!! be happy!! !have a nice week end by Italy!!! Congrats!!! I just had my 2nd child, a son, in January. He was a big one too 🙂 Enjoy your baby snuggles!!! Hi Midge! Thanks! Yes, he is and quite voracious! Hi Ling! Heehee 🙂 Thank you!! Congratulations, Joey! I very much enjoy reading this blog. Keep up the good work here!